Detailed mapping of the eye structure of five species of bioluminescent sharks reveals they have a higher rod densities than other sharks, report a team of international researchers in the journal PLOS ONE. The twilight — or mesopelagic — zone covers ocean depths from 200 to 1000 metres down. Only the shorter wavelengths of light at the blue end of the spectrum reach this far down. Mesopelagic sharks make up 12 per cent of all sharks and use bioluminescent light to communicate, find prey, and provide camouflage from predators. Some species of lantern sharks are only 50 centimetres long. “These amazing little animals aren’t well understood, so by studying their eyes we can gain useful insights into how these sharks make a living,” says study co-author, Professor Julian Partridge of the University of Western Australia. 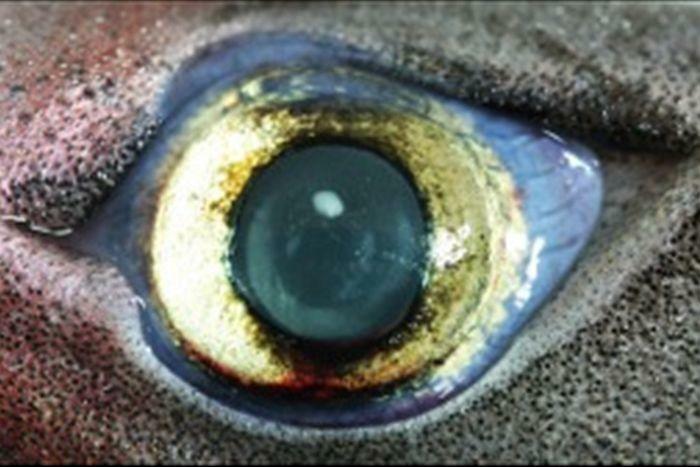 Partridge and colleagues examined the eye shape, structure, and retinal cell pattern of four lantern shark species — Etmopterus lucifer, E. splendidus, E. spinax and Trigonognathus kabeyai — and one dalatiid or kitefin shark species — Squaliolus aliae. The authors found the eyes of bioluminescent sharks are designed to capture as much light as possible. “We found things which hadn’t been seen before in sharks, such as a layer of tissue behind the retina to reflect and increase the light available to photoreceptors,” says Partridge. The authors also found gaps between the lens and iris of these sharks, allowing extra light to reach the retina. The sharks also had long thin photoreceptors, the rods in the back of their eyes which absorb light. Previous studies have shown that long rods are very sensitive to light, while thin rods detect fast movement. Bioluminescence often appears as just a brief flash. The ability of these sharks to see details in the shape of that flash tells them if it’s being produced by a potential mate, lunch or a predator. Partridge and colleagues found the density and distribution of the ganglion cells, which send information from the photoreceptors to the brain, indicates these sharks have relatively good resolution. “They can see fairly fine detail for a fish, although it’s not as good as humans,” says Partridge. The difference in density patterns indicates whether the sharks seek food directly in front of them or on the sea-bed below. Partridge and colleagues also found a strange translucent structure in the top of the eye which they believe is used by bioluminescent sharks to balance their own light emissions for camouflage, against the light coming down from above. “If you’re an animal in the sea where there’s still some down-welling light, you can look upwards for silhouettes that might then become your lunch,” says Partridge. These animals need to match the colour, brightness and distribution of light filtering down from above by constantly altering their light emitting cells or photophores to disguise themselves. “That’s always intriguing [to me] how an animal monitors both the down-welling light and its own bioluminescence to match the two,” says Partridge.